The name "liquid crystal" sounds like a contradiction, but it is a state of matter that has properties between those of solid crystals and liquids . Like ordinary liquids, its molecules are free to move about. At the same time, like solid crystals, the orientation of its molecules can be aligned with one another in a regular pattern. LCDs commonly use what are known as Twisted Nematic (TN) crystals. The molecules of a TN liquid crystal are cylindrical and are oriented in a twisted pattern as shown in Figure 6 (move slider to the left). The first molecule is perpendicular to the last molecule, and the in-between molecules automatically align themselves to form a twisted structure. These liquid crystals have two special properties that play a critical role in LCDs. The first is their ability to orient themselves along an electric field when one is applied . In the demo in Figure 6, when you increase the strength of the applied electric field by moving the slider to the right, the molecules of the liquid crystal get untwisted. For a strong field, the molecules are all aligned with the field. The second property is the ability of liquid crystals to twist the polarization of light passing through them . As shown in Figure 7, when no electric field is applied across the crystal, its molecules rotate the plane of polarization by 90 degrees. That is, horizontally polarized light becomes vertically polarized. 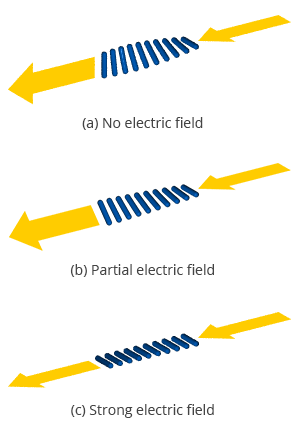 When a partial electric field is applied, the polarization plane is partially twisted to be between horizontal and vertical. When a strong electric field is applied, the light passes through with its polarization unchanged. Now, let us look at how polarizers and liquid crystals can be put together to control the brightness of an LCD pixel. "Liquid crystal". Wikipedia. [Online] Available: http://en.wikipedia.org/wiki/Liquid_crystal. "Twsited nematic field effect". Wikipedia. [Online] Available: http://en.wikipedia.org/wiki/Twisted_nematic_field_effect.